The Everspin MRAM process was developed specifically for integration in System-on-Chip (SoC) products. Everspin is developing products that combine microcontrollers and MRAM on one chip. 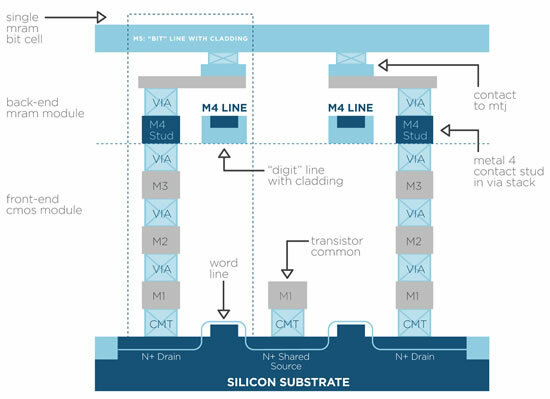 Embedded MRAM replaces Flash, EEPROM and SRAM with a single non-volatile fast memory with unlimited endurance. Everspin integrated magnetic SoC products provide improved flexibility to partition memory between programs and data. Programs and data can be updated dynamically in the field to improve security and upgrade system feature sets without SRAM volatility, program wear-out or the speed issues associated with Flash and EEPROM. Everspin integrates the embedded MRAM in the last two metal layers of standard CMOS logic processes using just a few added mask steps.